These four albums represent a category that is likely to grow exponentially in the years to come: SACD transfers of jazz recordings from the classic canon. All four are products of the Analogue Productions, a division of the audiophile mini-empire Acoustic Sounds. All four were originally recorded on one of the legendary jazz labels now owned by Fantasy, and all were mastered from the original analog tapes by Doug Sax, using third generation analog-to-DSD converters by Ed Meitner/EMM Labs. The Vince Guaraldi Trio’s Jazz Impressions of Black Orpheus is a startling example of the efficacy of this SACD application. It was one of the great, unexplainable commercial successes in jazz history (and all commercial successes in jazz are mysteries), and helped start the bossa nova craze in the early ’60s. On the Analogue Productions reissue, Guaraldi’s huge hit “Cast Your Fate to the Wind” is a like different piece of music from the version on the 1989 Fantasy CD Greatest Hits. The SACD pressing is color instead of black and white, three-dimensional instead of two-, full of complex overtones instead of crudely simplified. Guaraldi had a gift for finding percussive melodic hooks that are still likable, 40 years on. Bill Evans’ Sunday at the Village Vanguard was recorded on June 25, 1961, a day when the Muse spoke as perhaps it has never spoken since to a jazz pianist in a live setting. The material recorded on that day (enough for two albums, the second of which was Waltz for Debby, also available in an Analogue Productions SACD pressing) has been reissued in many configurations over the years. Until now, the best sounding version of Sunday at the Village Vanguard has been the 1998 release in JVC’s distinguished XRCD series. The XRCD revealed previously unsuspected subtleties and details in the original master tape. But even when going up against an absolutely optimized original-style CD version like that on the XRCD, the SACD is clearly superior, smoothing the rough edges of Evans’ piano notes and placing Paul Motian’s cymbals in a living space. With Scott LaFaro, a poet of the highest order, on bass, this trio sounded like music of the spheres. 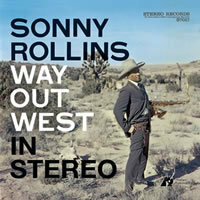 Another great opportunity to compare a JVC XRCD pressing to an SACD is Sonny Rollins’ Way Out West. It was made in the middle of the night on March 7, 1957, in the shipping room of a small Los Angeles record company, with an underpaid engineer recording a trio playing cowboy songs on a first-generation stereo Ampex tape deck through a homemade mixing console. It seems an unlikely setting for one of the greatest jazz recordings of all time, musically and sonically. But the players were Sonny Rollins and Ray Brown and Shelly Manne, and the engineer was the intuitive genius Roy DuNann. He could mix live-to-two-track on the fly, using state-of-the-art AKG and Telefunken tube microphones, manipulating the variable attenuators of his simple board in an archetypal application of the straight-wire-with-gain ideal. Way Out West, originally released on Lester Koenig’s Contemporary label, is another album that has been reissued many times over the years in every format, and the best sounding version until now has been the JVC XRCD. The XRCD pressing is so good, with Shelly Manne’s cymbals shimmering in free air and Rollins’ embouchure both fiercely articulate and finely nuanced, that for SACD to improve upon it is conclusive proof of its importance. The attacks of Rollins’ expletives are more explosive in SACD; we are more aware of Rollins’ movements as he swings his horn in front of the microphone; a last thin veil falls away.